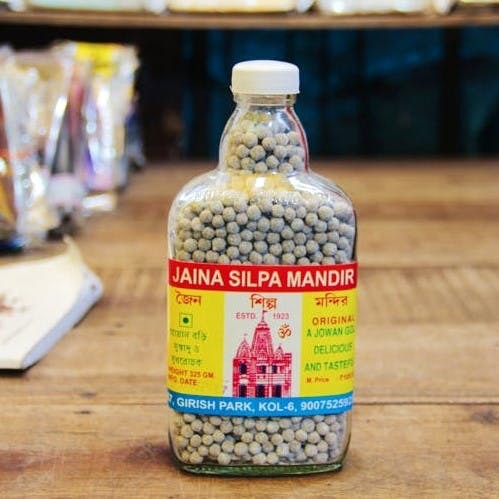 Remember the Jaina Silpa Mandir Hajmi that we couldn’t get enough of? Well, we found the place where the magic happens! Tucked away in the corner of Girish Park is a house where all the magic happens. Here you will get all the products under Jaina Silpa Mandir that are not easily available in the Gariahat shops. It is a family business which has been going on for generations. The family name’s ‘Jain’, hence the name Jaina Silpa Mandir. And (perhaps) hence also why all their products are made without onion or garlic. When you enter this house in Girish Park, you will meet the lady who is usually sitting and making one of their products and Anup Jain (the one who makes all the deliveries). Although they aren’t very used to people turning up at their doorstep, they were extremely welcoming. The place has cupboards full of the famous aachars and churans! They will let you taste different things if you are unsure about what you want to buy. They make over 20 varieties of churan and at least 10 different kinds of aachars (including mango, nawabi sweet and sour, Kashmiri, and hot and sweet). They keep experimenting and coming up with new recipes — their winter special is the aloo aachar. If you look up Jaina Shilpa Mandir on Google, it gives you a very accurate address. Get off at the Girish Park Metro station, the cheapest and easiest way to get there. Come out from the Jorasankho Thakur Bari side. From the metro, this place is just 5 minutes away!